Two weeks ago, millions of Americans cast their ballots in the midterm election with the highest recorded turnout, ever. The results were clear: Americans want change. Democrats took the House, and the most diverse Congress ever will be sworn in come January. Though they failed to take the Senate, this was not unexpected considering the extremely difficult map they were facing in this election. The Democrats celebrated victory. Now, just two weeks later, that victory somehow feels like a million years ago. Since the election, Jeff Sessions “resigned.” The White House revoked the press credentials of a White House correspondent, until a judge ruled to have them returned. Democrats scored a late victory in the Arizona Senate race. California faced its deadliest and most destructive wildfires to date, beating those of last fall. Not the types to rest on their laurels, the newly elected Democrats are already fighting. On November 8, Nancy Pelosi stated that she is 100% sure she will be the next speaker of the House. On November 14, her critics in the Democratic caucus said they are 100% sure she will not be. This conflict is not unexpected. Disagreement is the nature of a party that appeals to a wide variety of people and opinions. This fracturing was built up throughout the campaign season, where a variety of new candidates ran campaigns with promises to vote against Pelosi for Speaker. 10 freshmen and 13 incumbents were elected to the House with campaigns promising to oppose her. There is currently a letter being circulated, signed by seventeen Democratic representatives so far, pledging to not vote for Pelosi for Speaker. The list includes Tim Ryan of Ohio, Joe Cunningham of South Carolina, and a variety of other representatives, generally from moderate districts. Also, Rep. Abigail Spanberger of Virginia has pledged separately to vote against Pelosi. Pelosi has also faced criticism from more progressive members of her party, such as Alexandria Ocasio-Cortez, who joined a group of climate change activists gathered at Pelosi’s office in protest on the 13th. Ocasio-Cortez has since stated that she would support Pelosi’s bid for Speaker if Pelosi promises immediate action on climate change. As the debate around Pelosi’s bid for Speaker has intensified, another letter is circulating the Democratic caucus in support of Pelosi. It has been signed by 61 women so far, including several freshmen who had shied away from supporting Pelosi in their campaigns. Furthermore, several important progressive organizations, including MoveOn and Tax March, have issued statements of support. When a theoretical shoe-in for party leadership is garnering so much intra-party criticism, the question becomes: why is Pelosi so unpopular? Unpopular she certainly is, with her favuorability ratings at 31% in exit polls from the election, 14 points below Trump’s. This is most likely the result of a massive opposition effort to paint Pelosi as “a cartoon character, a symbol of partisanship, liberal excess and Washington politics” as described by David Axelrod, former Senior Advisor to President Obama. These criticisms became common in her own party, with moderate Democrats seeing her as a toxic symbol of liberal failures, and young progressives seeing her as an outdated relic of establishment politics. Despite all this, Pelosi is still the most qualified candidate for Speaker. She has held the role before. No, she is not a particularly inspiring symbol of change and the future. But, she is an effective legislator that the Democrats desperately need while facing an impossible situation with a minority in the Senate and a completely uncooperative White House. All of this will come to a head this month when the Democrats hold a vote on their candidate for Speaker. Then, after being sworn in in January, that candidate will run against a Republican candidate for Speaker. The strategy of anti-Pelosi Democrats is to use their letter of opposition to convince her that she does not have enough support to win next year, forcing her to step aside and allow for new candidates to emerge. However, many feel this is an empty threat because it would be political suicide to oppose one’s own party and elect a speaker of the opposite party when one’s own party has a majority. The likely outcome is that many Democrats will oppose Pelosi in their own election for speaker, then support her in the House election, as many did in the 2016 leadership race. At the moment, though the 17 Democrats who have signed the letter are enough to defeat her on the House floor, Pelosi shows no sign of backing down. On November 16, she met with many of her critics, including prospective rival Marcia Fudge of Ohio, who later stated her support for Pelosi. Fudge stated that “the biggest issue we discussed was the feeling within the caucus who are feeling left out and left behind,” and that while Pelosi did not ask her not to run, she did ask what Fudge would need to support Pelosi’s bid. 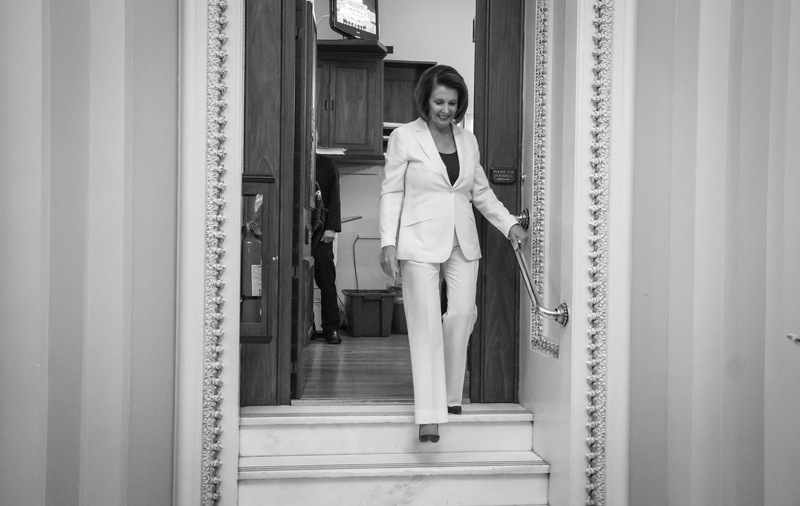 It remains likely that Pelosi will be approved for Speaker. Unless her critics can convince more Democrats to vote against her (which seems unlikely due to the lack of compelling challengers) she has the votes to win in the Democratic caucus election. When it comes to the vote in the House, it’s highly improbable that Democrats will actually turn against her. With a positive outcome so likely for Pelosi, it may seem pointless for Democrats to challenge her. However, these representatives may have spoken out against her with a different goal in mind: getting her attention. The Representatives hinting they might vote against her, most of whom are on the right of the Democratic spectrum, want a larger role in the Democratic caucus. They are reminding Pelosi that they won’t just fall in line with her agenda. They, and their constituents, have voices that must be heard. The best possible outcome is that Pelosi will make them feel that they are, and the priorities of the Democratic caucus will shift towards the priorities of the voters. But this may be an overly optimistic view of the next few years, especially when this situation is viewed as a microcosm of a larger problem within the Democratic party. Voters want change in the party, but are deeply divided on whether that change should be a move further to the left, or a bid for middle-America, pro-union, moderates. The importance of this struggle for the Speakership isn’t necessarily about who becomes Speaker, but about what deals Pelosi makes to get there. Though the outcome of the Speakership may seem predetermined, this is still an important moment in defining the next two years, and perhaps the upcoming election and the four years that follow. For many, Pelosi represents the Democratic establishment and all the things that made the party unlikeable enough that Hillary Clinton lost to Trump in 2016. Pelosi certainly has an image problem, but the criticisms levelled at her are characteristic of a larger problem the Democratic party faces: defining its own identity. Pelosi faces criticism from both the left and the right of the party. By picking the middle ground, she may isolate two sides of the spectrum. If we’ve learned anything from the last couple years, it’s that trying to straddle the middle ground doesn’t inspire people to vote for you.